We offer a selection of high quality imitation gold and silver leaf. 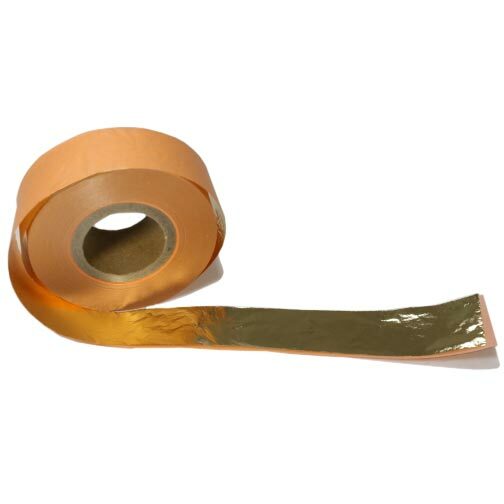 Imitation gold leaf is made of 85% copper and 15% zinc. It is sometimes called Dutch metal or Composition Leaf, and is similar in color to 23k gold. Imitation silver leaf is made of aluminum. Both are available in leaves of 6 1/4" square, and in 164' (50m) rolls of widths from 1/2" up to 6". Variegated Leaf, which is made made of imitation gold leaf that has been treated with heat and chemicals to create different color patterns. Variegated leaf is available in 5-1/2" square loose leaves.